Classification of Lambrusco typologies: vine and area to which they belong Lambrusco is made up by different varieties of wine, typical of Modena, Reggio Emilia and Mantua areas. During the years Lambrusco was classified depending on the areas where vine belong. Sorbara wine takes its name from the suburb of Sorbara in the municipality of Bomporto, in the province of Modena. It is cultivated in the area, which lies between Secchia and Panaro rivers, and moreover Sorbara wine is an ancient native variety, exclusive of Modena and with very specific characteristics. Another peculiarity of this vine is the phenomenon of “acinellatura”, an anomaly caused by the sterility of the pollen: grapes keep the same size of few millimeters, arousing considerable loss of product. This specific characteristic contributes to make this red wine incomparable and refined. For the production of this wine you have to use at least 60% of grapes of the same vine, with possible additions of Salamino Lambrusco for a maximum of 40% and other Lambrusco wines (alone or together) up to a maximum of 15%. Sorbara wine is produced in four different typologies: red spumante, rosè spumante, red sparkling wine and rosè sparkling wine. 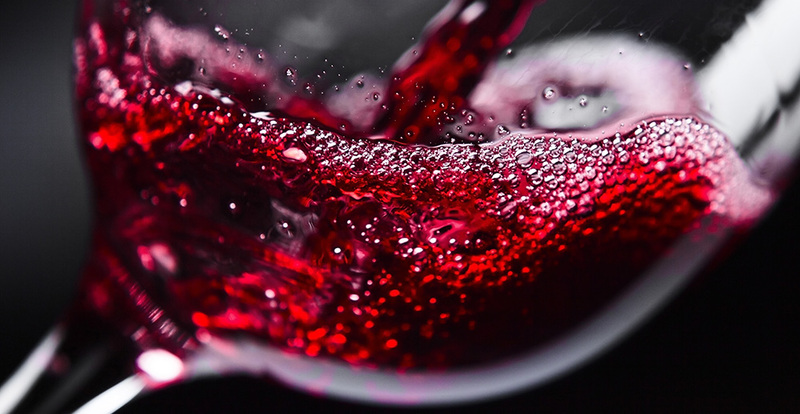 Between different Lambrusco wines of Modena, Lambrusco della viola (Lambrusco of the violet) is the wine, which has a colour near pink, characterised by fruity scents and by a fragrance of violet, which determines its nickname. Its pleasant flavour makes it perfect in combination with local dishes such as pasta with white ragù, tortellini in broth, roasts. Gasparossa wine is also known as Lambrusco di Castelvetro or Lambrusco di Spezzano. It is a sparkling and dry wine, with a strong ruby red colour with violet shades and fruity scent and a fragrance of berries. This wine is obtained by at least 85% by grapes with the same vine and it can be put side by side for only a maximum of 15% by other vines of Lambrusco, Malbo Gentile and Fortana. It generally is a less productive vine, but it is able to comply with the poorest territories. The maturing is rather late and the grape harvest occurs also in late October. A distinctive characteristic of this species of vine is that in autumn not only leaves redden, but also stalk and pimples, creating a particularly suggestive colouring, which enriches its areas with charm in the period of grape harvest. Grasparossa is perfect with savoury and substantial meals, such as first courses, lasagna and roasts; an excellent combination is that with salumi and typical cheeses of Emilian tradition or with aged or with herbs cheeses. At the end of the meal it combines well with sweets. It is produced for at least 85% with grapes of native vine Salamino Lambrusco, with little percentages of other vines such as Lambrusco Ancellotta and Fortana. This variety of vine has origin in the areas of Southern Modena, and such as the others, it probably derives from uncultivated vines, which grew in a spontaneous manner in the Appennino hills. For this reason these grapes were called “uzeline” or “useline” because, growing spontaneously at the sides of woods, they were eaten by birds. Salamino di Santa Croce takes its name from a district of Carpi municipality, and from this vine it develops in all territory of the province of Modena and in the provinces around. It’s a fresh and jovial wine, with a ruby red colour and a fruity and strong scent. Its bunches are little, with blue-blackish colour grapes and tasty slightly sour pulp. The Lambrusco Salamino vine is characterised by an excellent productivity and the maturing of grapes occurs in the first ten days of October. This wine is arrived only in 2009 in the category of Lambrusco PDO wines, Modena wine is produced using a mixture of different types of grapes (technically grape blend). 85% is composed by different types of Lambrusco, which are cultivated in the province of Modena, while for a maximum of 15% it is possible to use grapes, which come from Ancellotta, Malbo Gentile and Fortana vines. It has a ruby red colour with violet shades in the foam, a very pleasant fragrance and emphasized fruity and floral shades. 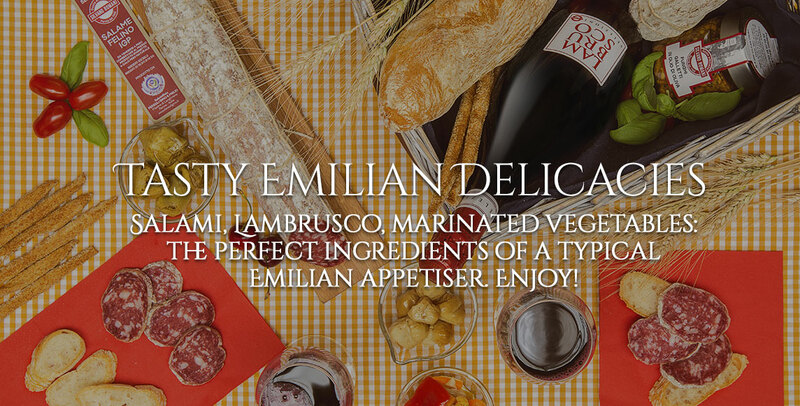 It is perfect in combination with first courses of meat and Emilian salumi. Marani wine is one of many vines from red grapes of the family of “vitis labrusca”; the vine has a constant and high return, with better results in alluvial soils. Wines, which are produced with this grapes, are almost always sparkling, fresh and light, with a fruity of young red fruits olfactory range and floral touches. 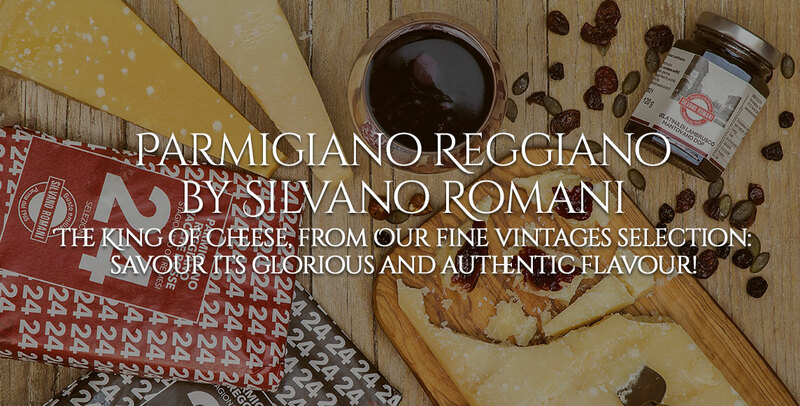 This variety is especially cultivated in the provinces of Parma and Reggio Emilia, as the name “Maestri” proves and it would derive from “Villa Maestri”, in the municipality of San Pancrazio in the province of Parma. Lambrusco di Parma IGP might in fact include at least for 85% the variety Maestri wine. This vine is often produced in grape blend with other varieties of Lambrusco, and it is appreciated for its ability to give colour, tannicity and body to wine. These wines with a strong ruby colour are known as “dark Lambrusco” and are typical of Reggio Emilia and Parma. Lambrusco Otello Nero di Lambrusco with a gold label is a masterpiece, which comes into the world from this variety of vines, produced from Ceci cellars. Lambrusco Otello was the first wine that received five grapes of Italian Sommelier Association, an important recognition, that is a guarantee of quality and excellence. The history of Lambrusco Otello begins in ’30 years, when a host of Southern Parma, Otello Ceci, served salumi and Lambrusco to the customers of his restaurant. In a short time, Lambrusco in the bowl of Otello achieved resounding success. Otello became the first label of Ceci cellars, affirmed reality at national and international level, authoress of some pages between the most important of the history of wines of the Province of Parma. This red sparkling medium-bodied wine exhibits an extraordinary red violet colour and a full and captivating fragrance, with a scent of strawberries, blackberries and raspberries. Lambrusco Ceci is the best Lambrusco that you can desire: its excellent tannicity, which mitigates it from remaining sugars, makes wine ideal in combination with products of Parmesan tradition. Moreover it is a wine for every meal, excellent with typical salumi of Parma, from Prosciutto Crudo to Culatello di Zibello, from Salame di Felino to Coppa di Parma. In addition it combines very well with typical dishes of Emilian cuisine: lasagna alla Bolognese, pappardelle, cotechino and zampone. You have to serve this wine at a temperature included between 8 and 10 degrees, preferably in wine glasses or glasses with a wide diameter. From the Lambrusco Maestri vines of Ariola small farms, here Gran Cru Marcello wine comes into the world, it’s a red sparkling wine of Parma. The term “cru” indicates wines with a high quality: Marcello wine is a red refined wine, which was awarded in Italy and in the world. Among the recognitions, Marcello Ariola wine was awarded at the International Wine Challenge in London and at Vinitaly in the year 2011. Its flavour is wide, captivating, with shades of blackberries and a memorable end. Moreover its scent is fragrant and fruity, with fragrance of marasca, berries and roses. Marcello wine is ideal for all typical dishes of Parmesan cuisine: salumi, anolini in brodo, first courses with sauces and ragù, rosa di Parma, boiled meats, stews and dishes with fish. The Montericco vine takes its name from the namesake place of the municipality Albinea, in the province of Reggio Emilia. This variety of Lambrusco is little widespread and is used for the production of Lambrusco of Reggio Emilia. Moreover it’s a wine with an harmonious and slightly sour taste, ideal in combination with typical dishes of Emilian tradition, such as zampone and lentils. This variety finds a lot of popularity in the areas of Reggio Emilia and in its suburbs also beyond Po river; it actually represents 15% of Lambrusco of Reggio Emilia, which is exported with a considerable success. 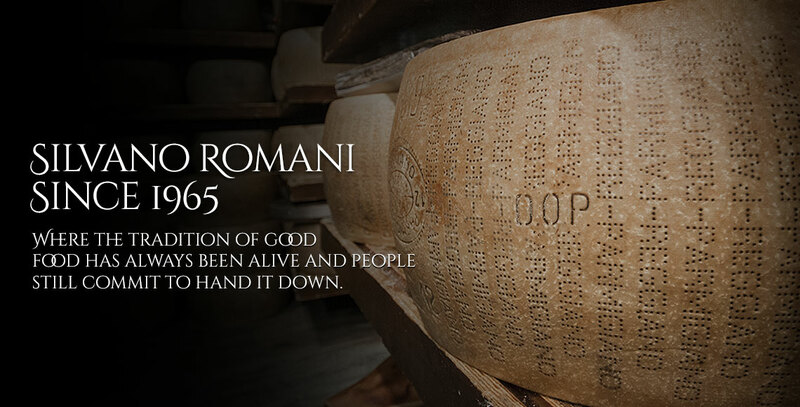 It is used for the production of wine known as “Rossissimo”. Ancellotta is included between the best qualities of Lambrusco because it sometimes happens that some wine is produced in purity. Moreover it has a very strong colouring which exhibits a scent of red fruits.